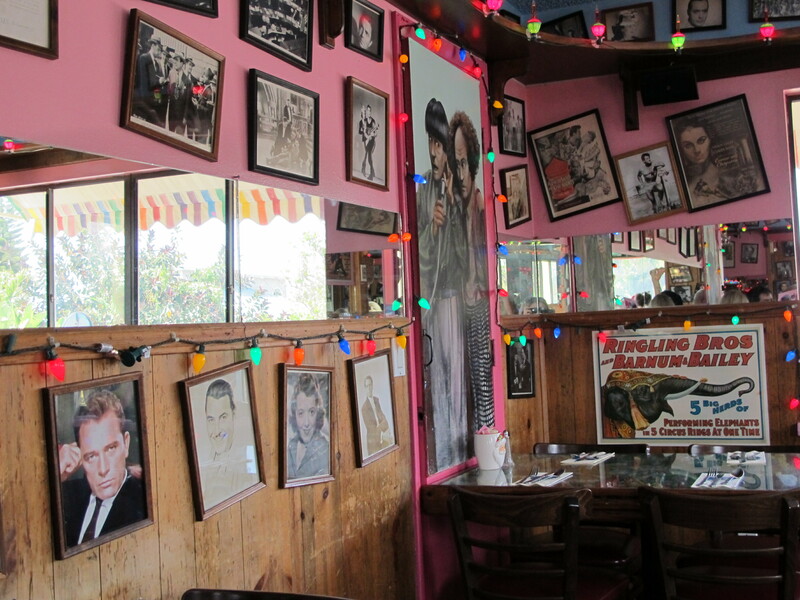 The Bubble Room is the kind of place that has over 50 pictures of Frank Sinatra. The kind of place where the servers dress up like boy scouts, the tables bulge with glass covered memorabilia, and a toy train runs the circuit of the room to the soundtrack from “Singing In The Rain.” At the Bubble Room, the wait staff smiles rather than glowers when you ask them to take your picture, the dishes are named “Pita Fonda” or “Cluck Gable,” and the season is perpetually Christmas, twinkling through the steady stream of bubble lights strung throughout the building. You don’t really go to The Bubble Room expecting a great dinner, though the Bubble Bread (garlic bread topped with cheese spread and baked until, well, bubbling) and Flaming Socre cheese appetizers are worth the trip. You go to The Bubble Room expecting kitsch. Lots and lots of kitsch. 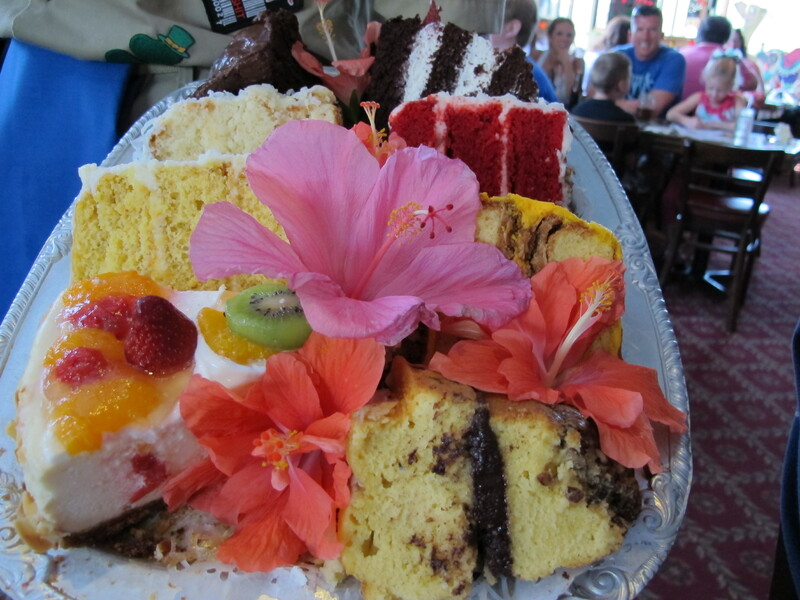 You also don’t go to The Bubble Room expecting to be impressed by their desserts, but it is the weighty tray of homemade cakes that keeps everyone coming back. My family’s perennial favorites are the Red Velvet and the Orange Crunch Cake (white cake, orange icing, brown sugar/almond/etc. filling); we’re so focused on those two that we don’t always allow our Bubble Scout to spend his or her usual 10 minutes describing the White Christmas Cake, New York Cheesecake, Three Layer Chocolate Cake, or Jamaican-Me-Crazy Rum Cake. 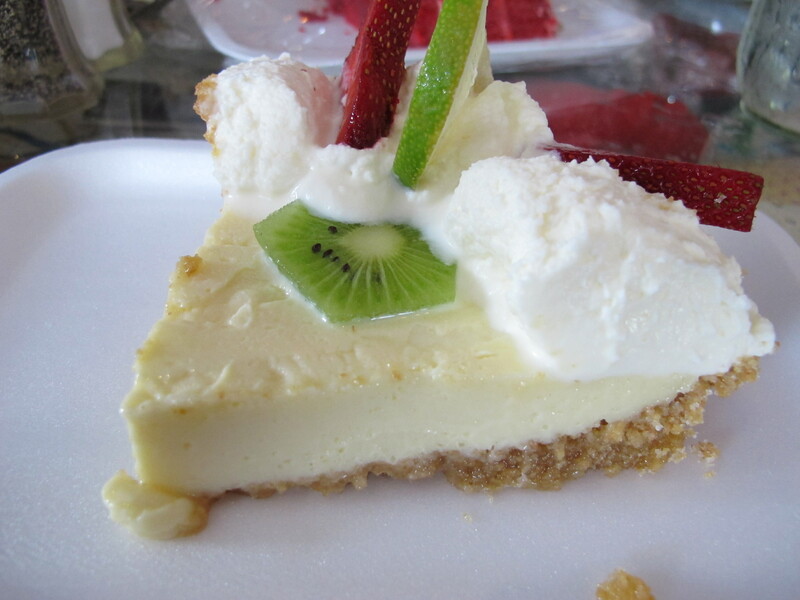 This year my family was kind enough to help me with my Key Lime Pie Contest. 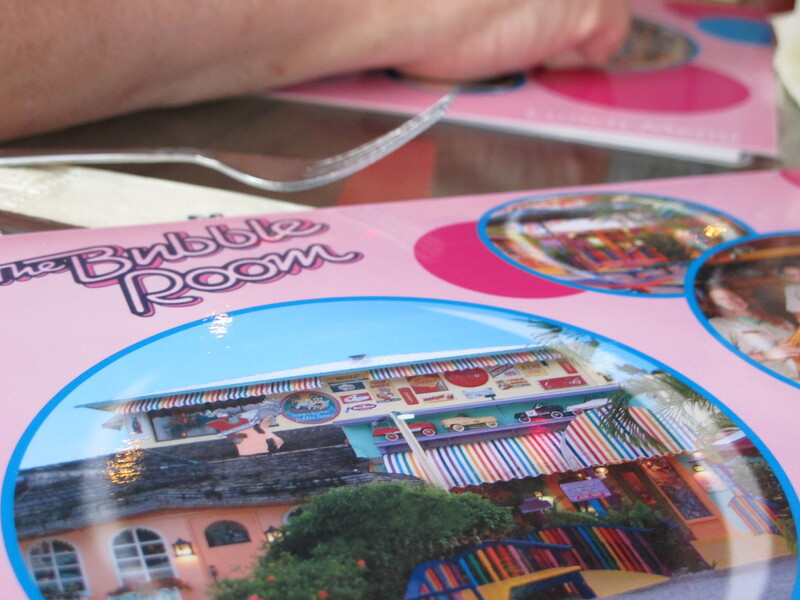 For the very first time in all of our many years at The Bubble Room, we branched out. Unfortunately, we determined that you also don’t go to The Bubble Room for Key Lime Pie. The filling flavor was good, not great. Too bitter for my taste, though BoSB, who prefers it that way, thought it was perfect. The texture was good, creamy and custardy. The crust was a little confusing. Graham cracker base, but with what seemed like too much brown sugar mixed in, causing a weird crystalized crunch. The extras – fruit and whipped cream – were a nice complement, but nothing too exciting. Don’t go to The Bubble Room for Key Lime Pie. Don’t go expecting a gourmet meal. Don’t go if small spaces filled with old things that can’t really be called antiques freak you out. 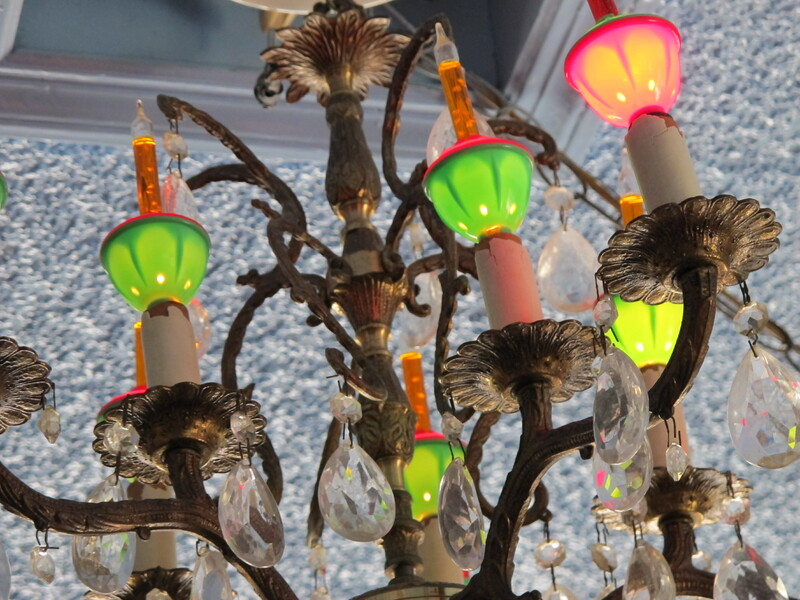 But do go to The Bubble Room, because for all its kitsch, it’s fun. Check out the “Booz-O-Meter” in the bar area, and get your picture taken in The Tunnel of Love. Browse the photos of black and white movie stars while you wait for your table, become a little transfixed by the gurgling bubble lights. 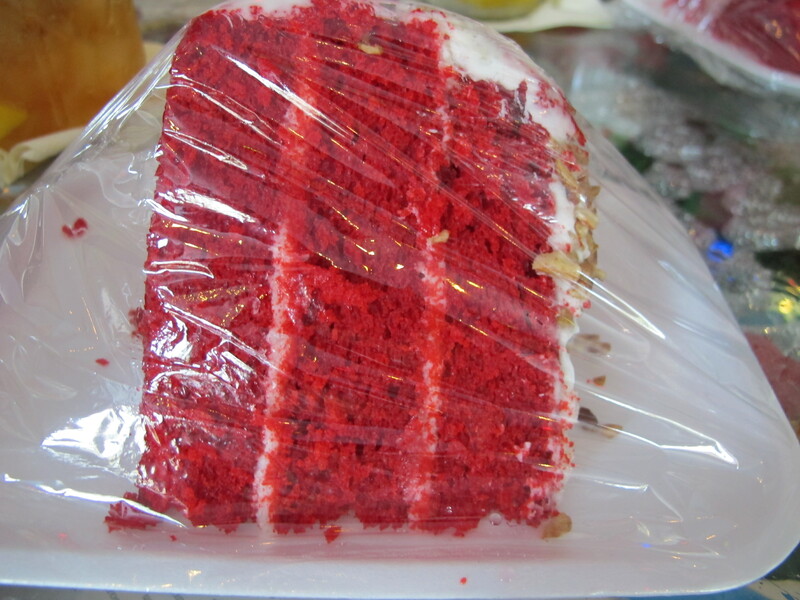 And don’t leave without a piece of Red Velvet or Orange Crunch Cake.